To commemorate the release of Marvel’s Thor: Ragnarok on Blu-ray, New Era Cap has released this pretty cool Thor: Ragnarok 9FIFTY Snapback Hat Collection! 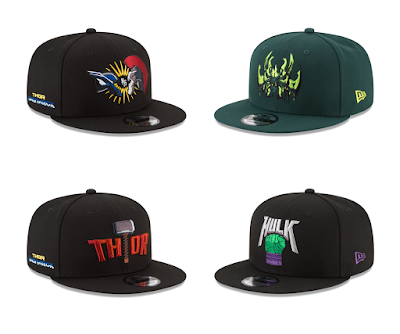 There are four designs in this collection: Thor, Hulk and Hela character hats and a killer Thor vs. Hulk Dueling design. Each Marvel cap features an embroidered design on the front two panels, with the film’s logo embroidered on the right side and the New Era logo on the left. All four Thor: Ragnarok 9FIFTY Snapback Caps are currently available at the New Era online store for $30-35 each.